HE Amos Sawer was designated head of Mission for Togo. –Number of candidates and their parties The people of Togo went to the polls Saturday, April 25, 2015 to elect their president for the next five years. There were also five political contestants including the incumbent president Faure Gnassingbe of the Union for the Republic (UNIR) party who had been in power since 2005. 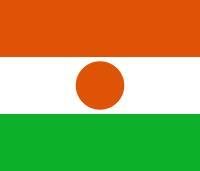 – Mouhamed Tchassona Traoré Citizen Movement for Democracy and Development (MCD). There were 3,509,258 registered voters in the West African francophone country of 7,000,000 citizens. According to the Togolese Constitution, there is no limitation of presidential terms in Togo. Election is by a single turn with any clear winner taking up the reins of power. This arrangement is sequel to a constitutional amendment made in 2002 by General Gnassingbe Eyadema, who ruled the country from 1967 until his death in 2005. Before then, the question was whether the Togolese people would choose to alter the status quo or continue with an arrangement that saw Faure Gnassingbé, being brought to power by the Army in 2005 following the death of his father, General Gnassingbe Eyadema. According to final official results announced by the Constitutional Court, Faure Gnassingbé was re-elected with 58.77% of votes cast. Jean-Pierre Fabre scored 35.19%. He initially challenged the election results, deeming it fraudulent. The Jean-Pierre Fabre denounced the election claiming it was fraudulent. He also contested the results had already contested the provisional results published earlier by the Independent National Electoral Commission (CENI), which credited Gnassingbe 58.75% of the vote, against 34.95% of the vote to Mr Fabre. CENI put the turnout of voters for the Togolese Election at around 53-55 %. This is at least 10% lower than the last elections in 2010. 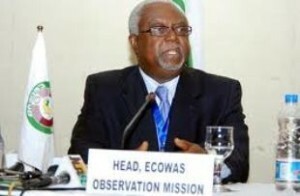 The ECOWAS Commission deployed a 100-member Electoral Observation Mission led by former interim president of Liberia, Professor Amos Sawyer, to oversee the presidential election. 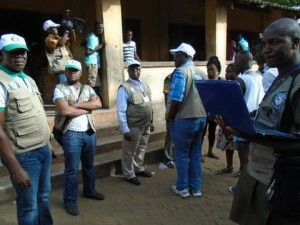 An ECOWAS Long-term Observation Mission, composed of twelve experts in conflict prevention, elections analysis, gender and media management was deployed several days before and after the exercise to follow up on pre and post electoral operations such as campaigns, actual voting and post-election situation. In its preliminary statement, the ECOWAS Electoral Observation Mission welcomed the efforts of all stakeholders, especially the people and government of Togo, the police and other security forces in ensuring that the election was conducted in a peaceful and tranquil atmosphere. The Togolese Presidential election was initially scheduled for 15 April 2015. It was then postponed by ten days at the recommendation of John Dramani President of Ghana and former chairman of the heads of state and government.